I love salsa verde. 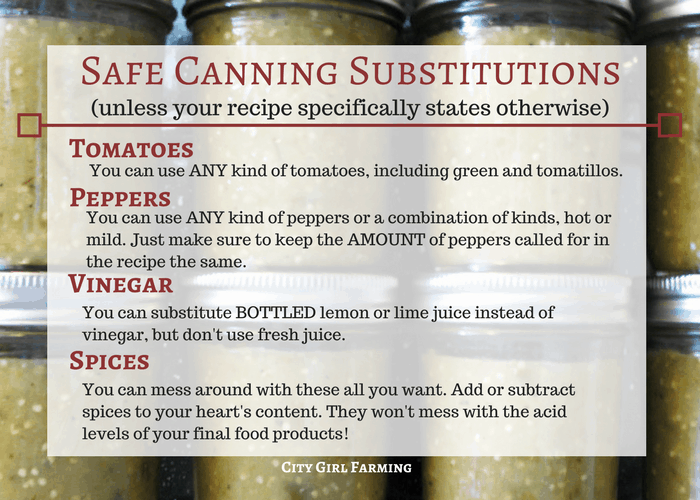 And I love this canning recipe. I’ve been making it for years and it never disappoints. (Of course, it goes without saying that I’m a huge Mexican food FREAK. I could–well, um, I almost do–eat it daily.) 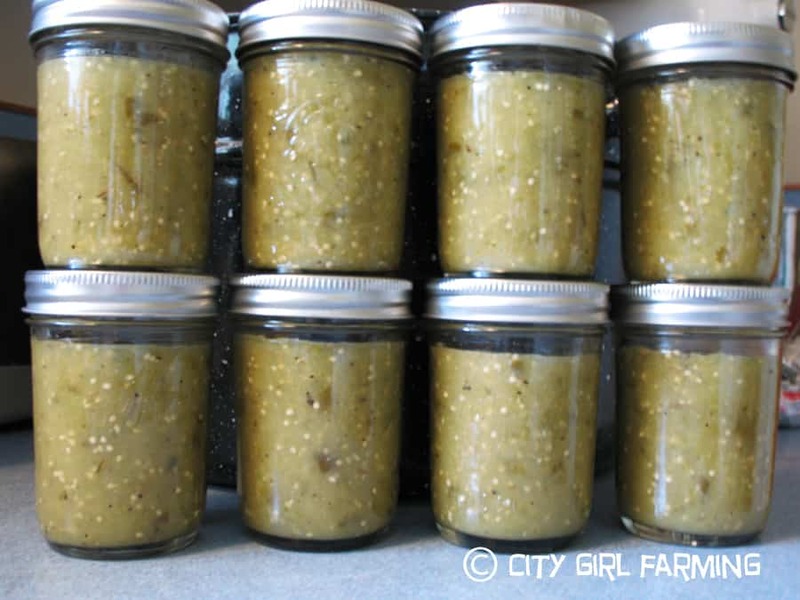 I grow lots of tomatillos every year so I can make several batches of this delicious sauce. I think you’ll like it too. 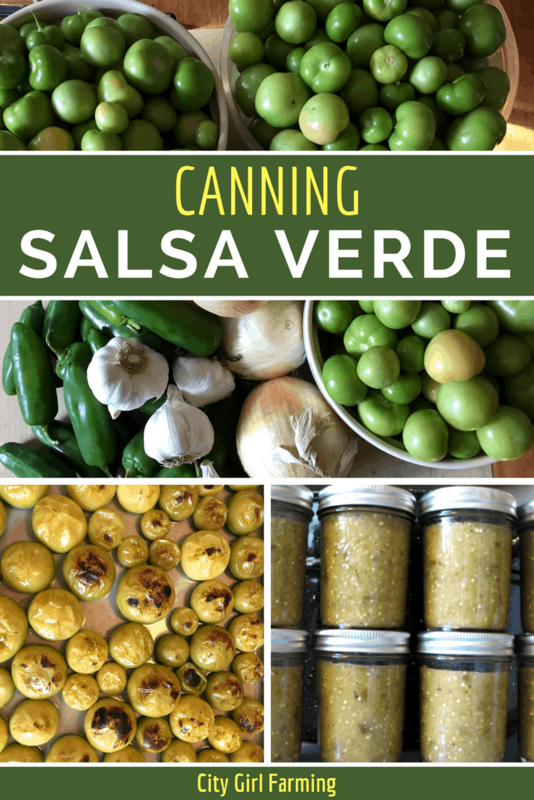 I get my salsa verde recipe from one of my favorite canning books: Put ’em Up by Sheri Vinton. If you don’t have it already, I highly recommend it. This recipe makes about 8 cups. 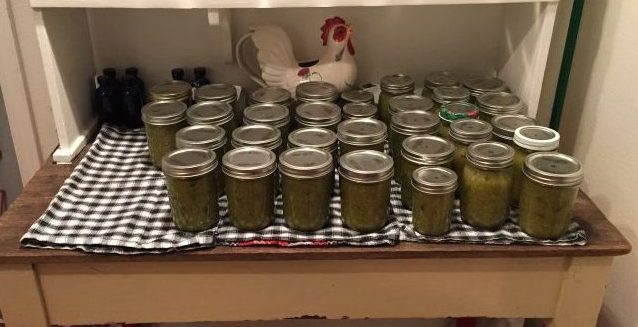 I generally can 6-8 batches to tide me through from garden season to garden season. 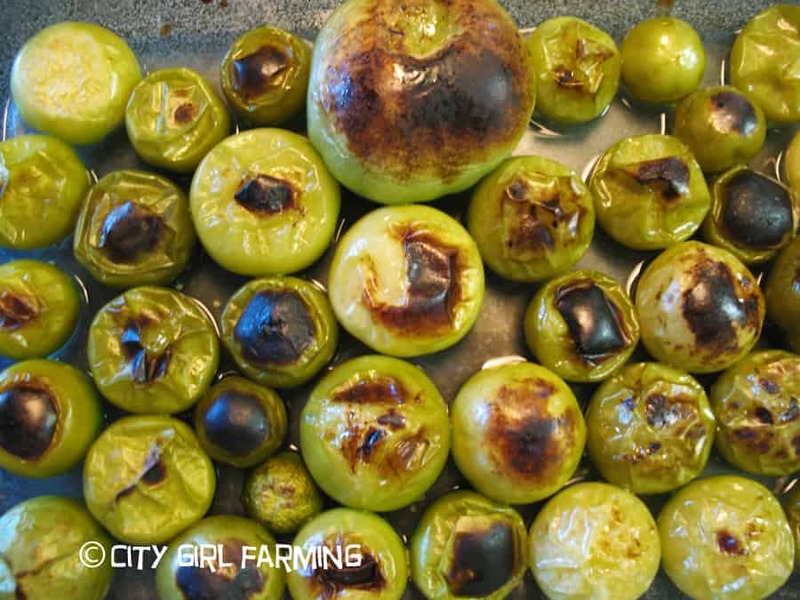 First, broil half the tomatillos in the oven (or on the grill) until blackened in spots (rub them with olive oil first). Even though the recipe doesn’t call for it, I broil/grill the peppers as well . I love that slightly charred, smokey taste. 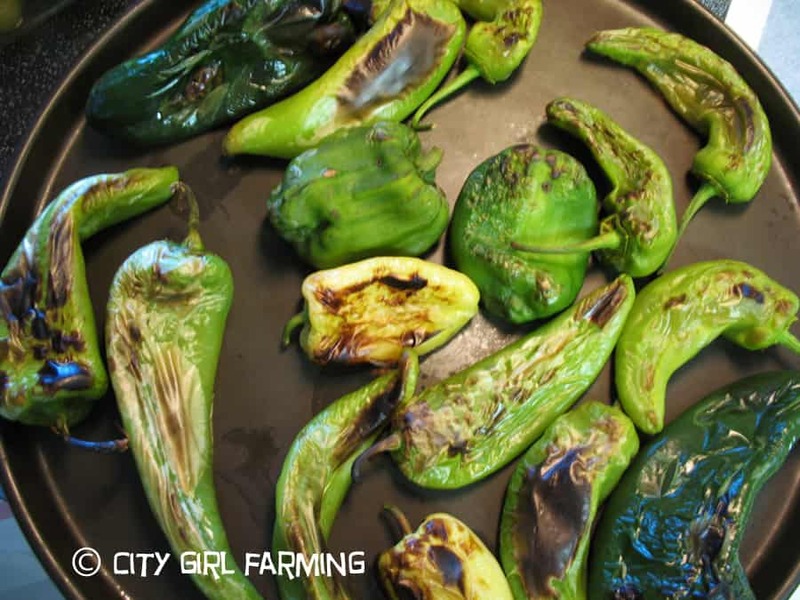 Remove some of the skins and the stem of the peppers, but not the seeds (unless you want it super mild…then remove the seeds or use mild tasting peppers to begin with). 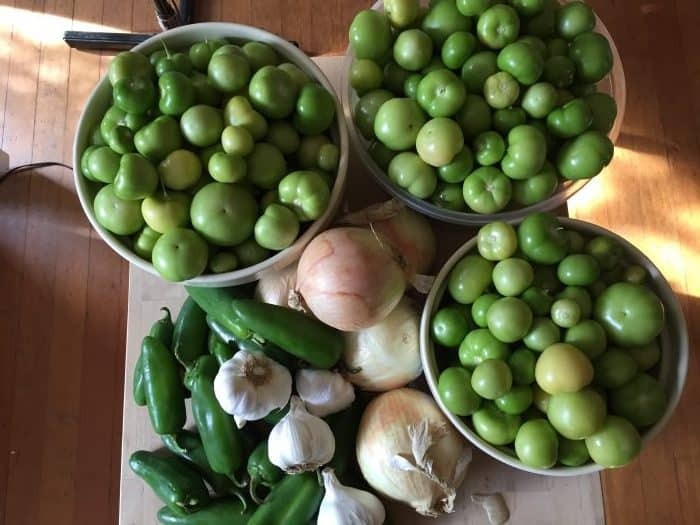 Once all the cooked tomatillos and peppers are cool, puree them with the onions and garlic in a blender and dump into a large non-reactive saucepan. 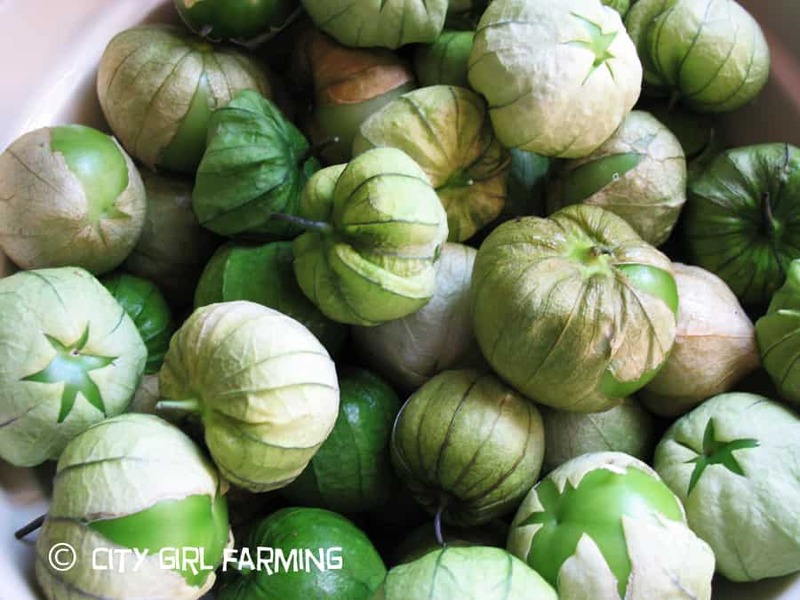 Puree the raw tomatillos with the vinegar and dump them into the saucepan too. Bring this mixture to a boil, then reduce heat and simmer until thickened (the recipe says to simmer about ten minutes, but I generally simmer mine about twice as long). Stir in cilantro and salt and remove from heat. 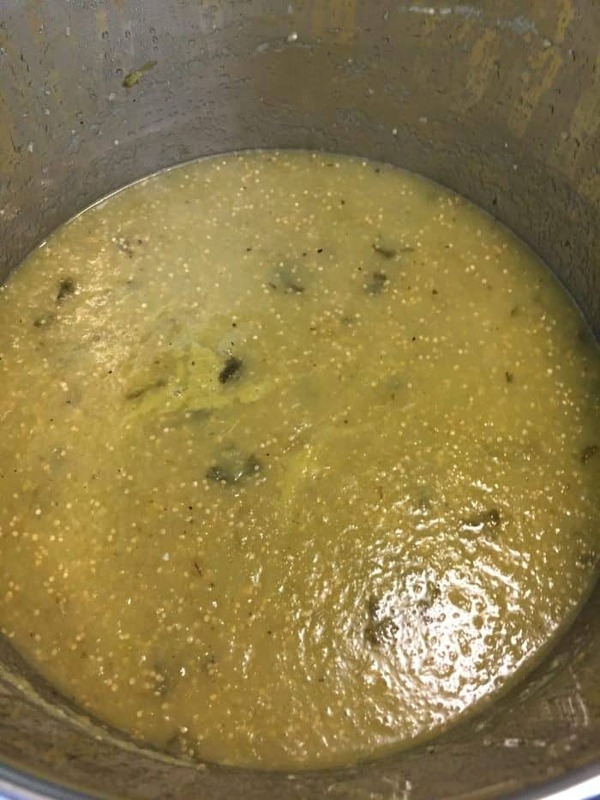 Remember that if you’re making salsa to can, you can’t get too creative and deviate from the USDA approved recipe if you want to stay safe (it messes with the acid levels which could potentially make the end product unsafe for consumption). However, there are SOME things you can do. I know that doesn’t leave a LOT of play room for people that like to experiment (I am one of those), but if you can’t help yourself and just need to play, don’t can it. You can do whatever you want if you’re just going to eat it (without canning it first). For this salsa, I added both pipicha and cilantro. Last time I was at Farmer’s Market, a sweet young girl sold me some pipicha, which she said she uses in her salsa. I’d never even heard of it before, but I tasted it and it had a similar (yet more spicy or peppery) taste to that of cilantro (which I love), so I bought some and threw it into this batch of salsa (I added some cilantro too because I couldn’t bear to completely leave it out). I also used lime juice instead of vinegar and I broiled both the tomatillos and peppers (I used a variety of chilies–just whatever peppers I had in the fridge already). You can adjust the hot factor of the salsa by the kinds of peppers you use and how many seeds you leave in. And the taste? Fantastic. One can never have too much salsa around. I stand by that statement wholeheartedly. Some of the links on my blog are affiliate links. This means that I will make a few cents if you follow that link and make a purchase. There is no additional cost to you and it helps me pay for this blog. Thanks for your support.